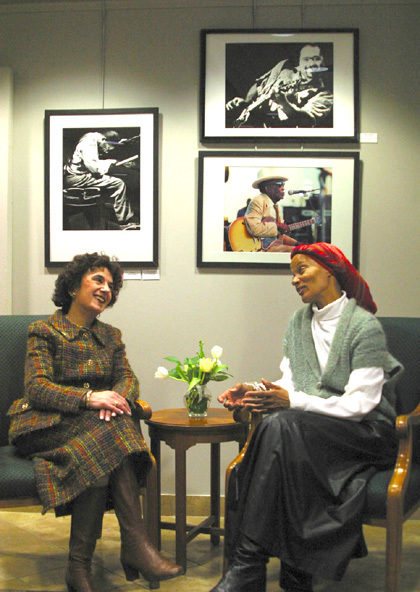 THE ART OF SEEING: Photographer Safi wa Nairobi, who is legally blind, chats with Princeton Township Mayor Phyllis Marchand at Sunday's opening of the ArtFirst! juried exhibit at the University Medical Center at Princeton. The photograph on the left won second prize for the photographer who sees with her camera. All of the artists in the show are professionals with disabilities and come from all over the country as well as India and Canada. A $67 million tentative budget for the 2005-2006 school year was announced at the Princeton Regional School Board's finance committee meeting on Monday. A $100,000 stretch of proposed pathway for Snowden Lane was approved by Township Committee Monday night, apparently bringing an end to opposition that had caused six months of headache for legislators and residents alike. A jazz club proposal for the former Mike's Tavern site on Bayard Lane has overcome yet another obstacle as a state superior court judge rejected a neighborhood-based attempt to block a variance that will allow for a 10,750-square-foot restaurant.